1. 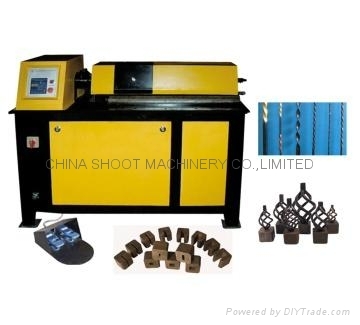 This machine is made on the basis of the original electric torsion and twist machine. The program of machine is automatic correction, that keep the all products are same. basket.Therefore the machine can twist not only pretzel shape but also flower basket (bird cage). 1. 6 sets for square steel: 25x25,20x20, 18x18, 16x16,14x14,12x12. 2. 3 sets for flat iron: 30x8,20x6,16x5. 3. 4 sets for basket: 2 sets for 16x16, the size of basket:H150xW80,H140xW70 (mm). 2 sets for 12x12, the size of basket: H130xW60,H100xW50 (mm).